I know I don't normally post on a Sunday but did so today in order to play along with a couple of challenges. This was fun to do, but lining up all those little squares was not any where close to being easy...at least for me. 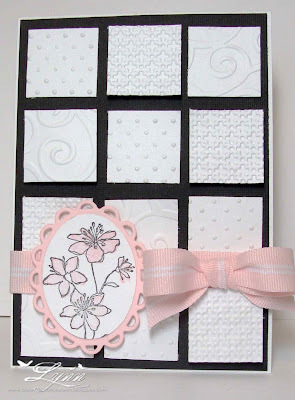 I used three different embossing folders on the squares and popped up some and left overs flat on the black card stock. The image is from Simply Soft (SU). 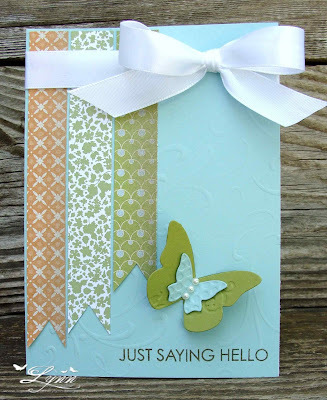 I'll enter this in the challenges at Mojo Monday (Sketch), Fab' n' Funky (No DP), Scrapalicious (Flower Power), and Simply Stampin (Perfect Pairs - I used two pair of each of the embossed squares. Blogger and I are not jiving at all right now........none of my scheduled posts are being published! Any suggestions? Oh, and thanks for all the fun suggestions on what to do with that TP from my previous post. I loved reading all of them. LOL! Thanks for stopping by..........and hope everyone has a great day. I usually do all the grocery shopping although he sometimes tags along. I have to walk behind him in the store so I can take out some of the things he puts in the basket and put them back on the shelf (you know, like you have to do with your children!) but he thinks he's a big help. Jim: I found a GREAT deal on toilet paper today. It was only 99 cents for 8 rolls! Jim: Well, I'm sure it'll be ok - I mean it's better than using newspaper, right? Lynn: The newspaper MAY actually be better - but we'll see. Jim: Maybe I should just let you get the toilet paper in the future!!!! So I'm now trying to think of ways to recycle toilet paper!!! Any ideas out there? I made a flower and it actually came out pretty cute but just didn't look right on this card. Any ideas would be appreciated! Thanks for stopping by..........and remember to smile! The new challenge at Creative Belli beginning today and running for the next two weeks is themed Animals! Come on over and let us see your creations with animals on them. Who knows, you could be the next Guest Designer! In keeping with the spirit of the Belli Challenges, be sure and use your old and forgotten embellishments. Also, check out all the creations from the DT. I first saw this image on Carol's Our Little Inspiration blog and then on Joan's Stamping with a Passion blog and immediately fell in love! Guess you could say it's pretty much a CASE of their cards. The image is from Impression Obsession and it was love at first sight for me! It's a large image and I didn't want to crowd it up with DP and all that so ended up stamping it, coloring the hats, adding some glitter, stamped the sentiment and then added the red and white Baker's Twine and also some regular twine. The button is from an old pair or blue jeans. I think it makes for a pretty, classic Christmas card. Edited to add.................The Belli Challenge has just reached 500 followers - WooHoo! To celebrate, we're giving away some BLOG CANDY!!! Head on over to the Challenge blog and check out all the details!!! Thanks for stopping by........and be sure and check out the Belli Challenge. I thought I'd start the week off with a CAS masculine type card. The image and sentiment are from Mark's Finest Papers and I'll enter this in their challenge this week. It's a very basic card with distressing, stitching, and that's about it! 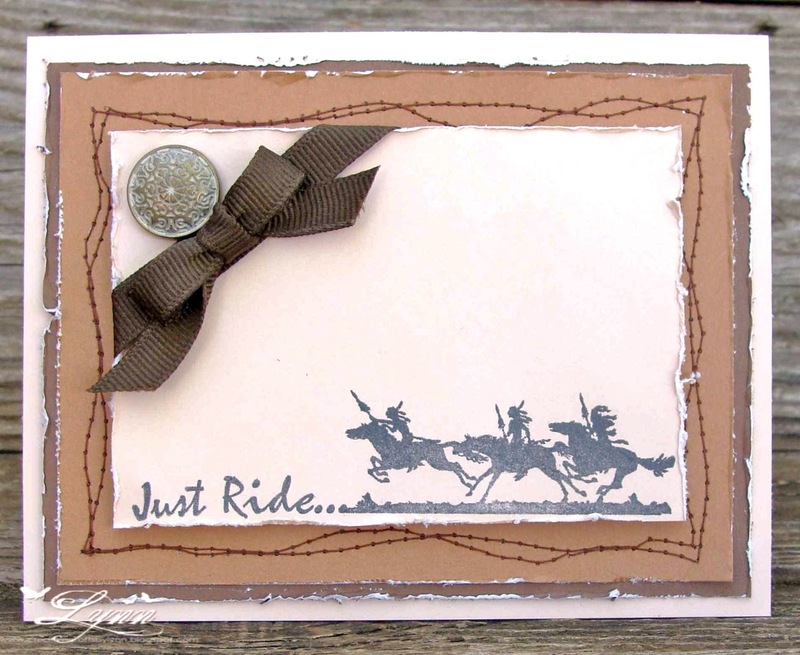 All the card stock I used for this is from CTMH - it's white core and great for distressing. 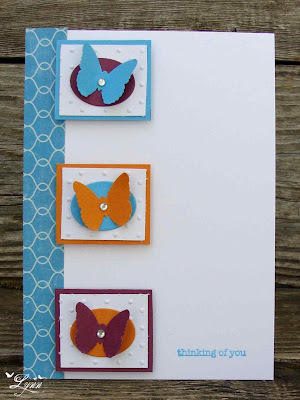 This is one of those cards that really does look better in real life and I think that's because of the card stock. I used some Chocolate, Brown Bag, and Parchment. The Parchment is such a unique color - not white or vanilla - it almost has a pinkish tone to it - But sadly, that didn't show up in the photograph. I did a little "crazy" stitching around it and then added the ribbon and that brad - which is from SU. After I finished the card I asked my husband if he liked it....since he thinks he's part Indian anyway and loves all things western, he of course said he loved it! Dang, I really like getting nice compliments like that! LOL!! I LOVE to fish and every chance I get, I go. There's just something about sitting on the side of a bank (or in a boat) dropping a line in the water, and then not caring whether you catch anything or not! LOL! 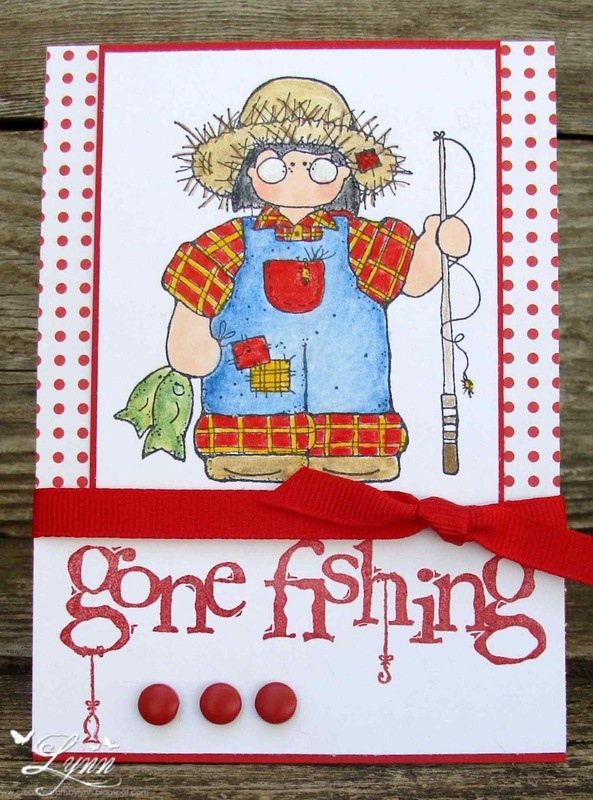 We haven't been fishing in a while but hope to do so soon since the weather is so pretty and not scorching hot yet. This is a rubber stamp from JRL Design that someone had given me last year.and I colored this little girl with Prisma pencils. The sentiment is from CTMH. The brads.....I was going to add some little fishing spinners down there - but am bound and determined to get rid of some of these big brads I have! I think I have every color of the rainbow - and way too many! Just a real quick post today - and showing you a couple of very quick CAS cards I made on Sunday. It just seems like I don't have any time anymore to craft! Maybe it's this beautiful weather we're having and I keep finding myself outside more. The butterflies were punched with a MS punch....added a strip of DP....did a little embossing and using Nesties.....matted them - and it's done. Did someone say they wanted to see a YELLOW card!! LOL! I used an old CTMH image and one of the new frame dies from SU. Also did some embossing and paper piecing - and again, it's done. I masked off an area in the center of the card and then sponged a layer of Tumbled Glass blue (intention was to make it sorta look like clouds - but not actual clouds) and then stamped the image from SU Fabulous Florets over it. The flowers have been stamped, colored, and then popped up on the image. 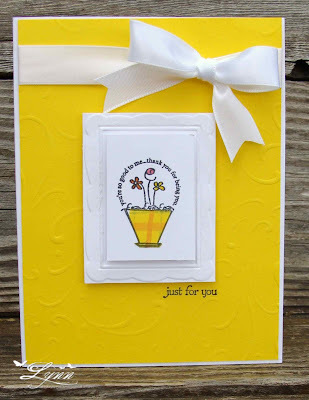 The sentiment (also SU) was stamped and then pearls added underneath it, to the centers of the flower, and a small bow around the stem of the flower....and bingo...it's completed! I'll enter this is the challenges at Just Us Girls (Technique challenge - sponge a layer), 2 Sisters Challenge (Flowers), and Lily Pad's Flower Challenge. Before I sign off for the day I just wanted to thank everyone so much for the wonderful birthday wishes on Saturday! I received some beautiful cards from several of you and I appreciate each and every one of them. This birthday was one of the big ones - yep, I turned the big SIX FIVE (I know I look MUCH younger though! LOL). I'm just so thankful I made it this far and it's nice being a "senior citizen" now because everyone seems to have more patience with me! LOL! I had a great day and all the wishes I received from you made it even more special. Thanks! How do you like that title for a post in the middle of April! LOL! Actually, my mind just went blank on trying to think of a good title for this post so went with the sentiment on my card! 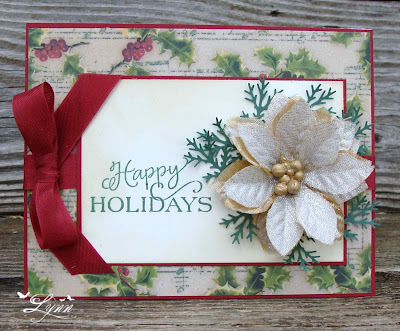 I'm playing again in the challenge over at Merry Monday! Be sure and check out the sketch.....so far I've fallen in love with all of Lesley's sketches and this one is no exception. If you remember back around Christmas time I used an artificial poinsettia (since I was too cheap to buy the die) that I'd gotten at the Dollar Store. Well, there were red ones and also some gold colored ones in the little pot. For this card I used a gold one but really think I prefer the red ones.....anyway, using the Merry Monday sketch for this week I created another card for Christmas! The sentiment is from Studio G and I used Cherry Cobbler and Very Vanilla (that I sponged some Antique Linen around) card stock and Paper Studio DP. 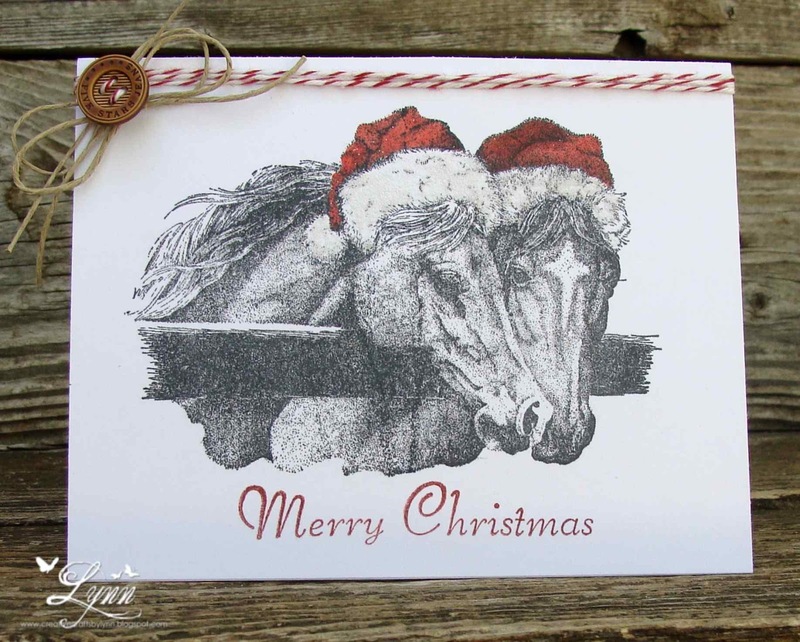 It's really nice knowing I'm going to have so many of my Christmas cards completed before December! Thanks for stopping by..............and have a wonderful weekend! The challenge beginning today over at Creative Belli is themed "children". Come on over to the blog and check out all the great inspiration from the Design Team and then submit your project for a child. Remember, in keeping with the spirit of the Belli Challenge to use your old and forgotten embellishments. I thought that little Mickey Mouse would make a great card for any child - boy or girl. I mean, I STILL love Mickey (and Pluto and all the rest). I used the Happy Birthday embossing folder on this card and don't think I've used it but maybe once before - I just always forget I have it. 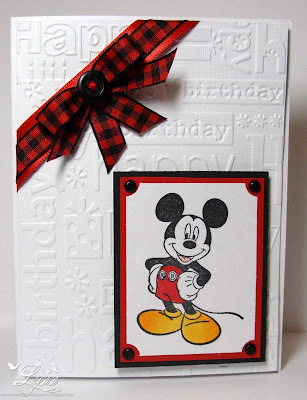 A very simple card but will work for a cute Birthday card for a child. Thanks so much for all the comments on me trying to get well around here......I'm feeling so much better and will hopefully get around to everyone's blog sometime later this afternoon. Instead of a "six pack", the doctor gave me a "four pack"........get up and go shot, Z pack, steroids, and cough syrup! Gotta love those docs! For as long as I've been blogging, I've pretty much posted something on Monday, Wednesday, and Fridays....but no post today! I've been a tad under the weather the last few days. I seem to just want to sleep a lot. I call it the Super Crud - you know, allergies turn into sinus problems, then travel their way down to the chest to see what kind of destruction they can cause there! So, I'm off to the doc today to get something for my super crud and hopefully will bonce back soon. I have a post scheduled for Wednesday but will try to be back before then. Thanks for stopping by.....and will be back whenever I can. Hi! I hope everyone is having a happy Friday. I've been so slack on my Funny Fridays lately so thought it was about time to (hopefully) put a smile on your face. I've had this image from Just Inklined since last year and decided it was high time I used it - mainly because my brother in law has a birthday coming up and this will be perfect for him. I was busy coloring this little dude and trying to think of a cute/funny sentiment for it.....got to the feathers and ........ YIKES!!! It REALLY looks like that feather is coming out of his fly!! LOL! I simply could NOT quit laughing!! 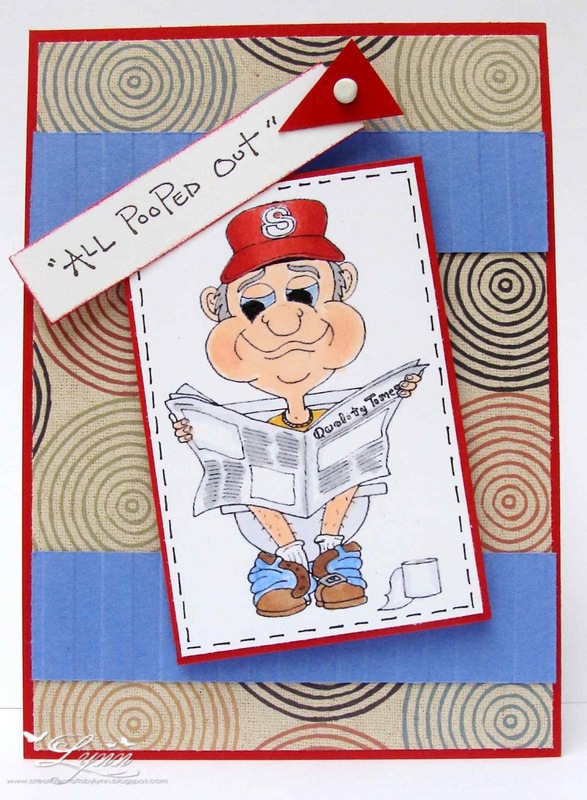 So I kept the card VERY simple - guys just don't like a lot of "stuff" on their cards - and on the inside put "That's what happens when you get older!". I'll enter this is the challenge over at Dude Time Doodles - to use a funny sentiment. They may be the only ones that will have me with a sentiment like that! LOL! Thanks for stopping by......have a wonderful weekend.......and keep smiling!!! 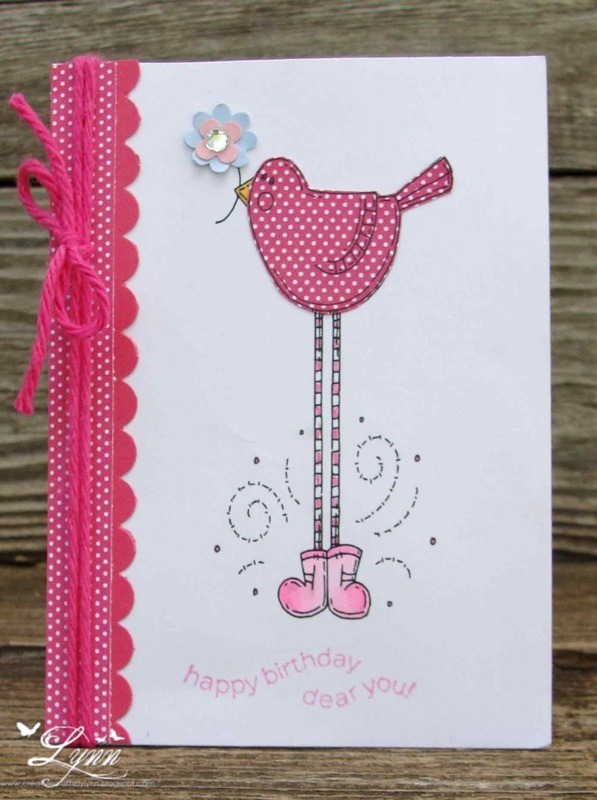 I just love this little bird image from Meljen's. There's something about those LONG legs! What is it they always say....I'm not fat, I'm just too short!! Well, this little guy is certainly tall so shouldn't have any worries about his weight! 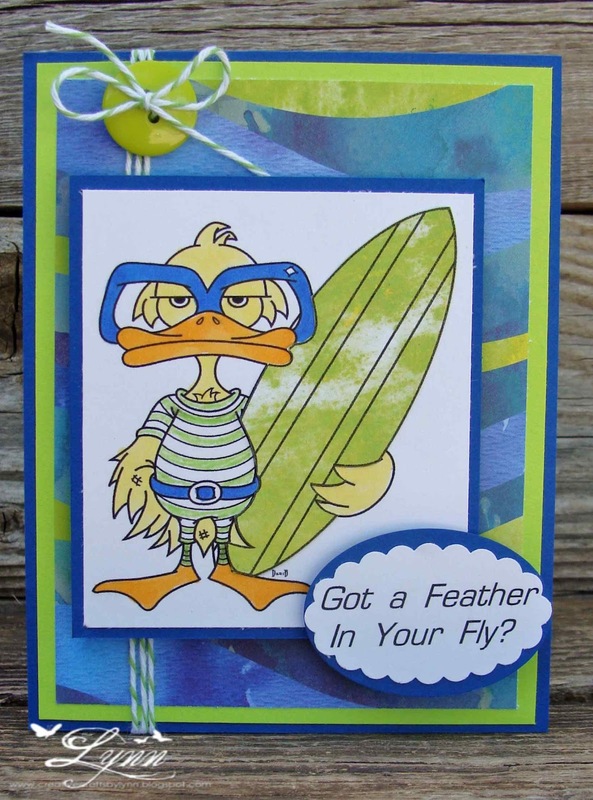 I thought he'd make a great card for a spring time birthday. As I said the image is from Meljen's. All the paper and sentiment are from SU. I also just used some plain old yarn on it instead of the Baker's Twine. When I was making it, I kept thinking I had a sentiment that said Happy Bird-day......but after looking high and low, couldn't find it. I got the entire card completed - and then found it! UGH! One of these days I'm going to un-mount ALL of my sentiments and put them in the same place! Oh, well.....it still will get the birthday message across I think. 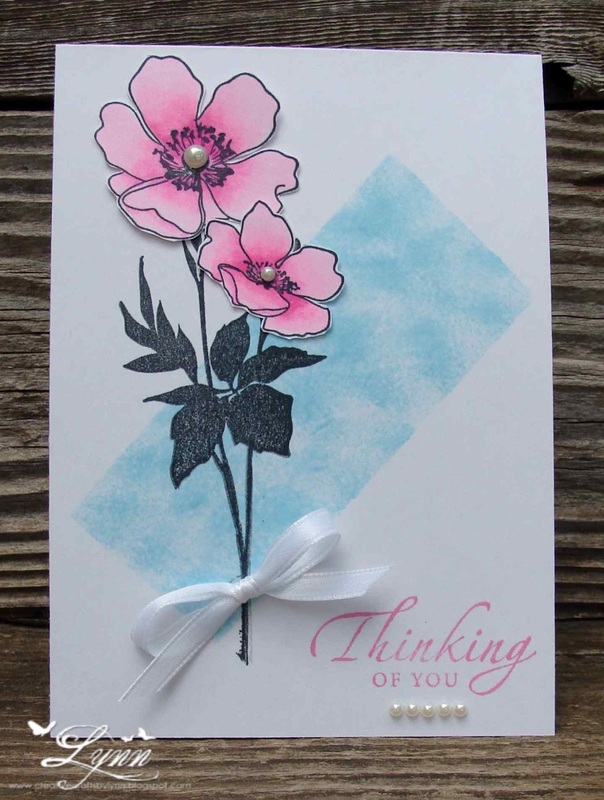 I'm not sure what's going on with me and all the pink on cards these days - especially when my favorite color is blue!! Maybe I just have too much pink paper! Thanks for stopping by........and if I get off my duff around here, I'll get a Funny Friday made and posted....We'll see! I never buy the "In Colors" from SU but broke down and bought one package of the variety a while back - and must say, they're very pretty! I also got a pack of the Twitterpated DP and it matches so nice with those colors. I used Pool Party and Lucky Limeade and several strips of the DP for this card. The butterfly was completed with the Beautiful Wings die and the sentiment is from Hero Arts Everyday Sayings. After stamping the sentiment on the Pool Party, I used a Texturz plate for embossing....a very subtle embossing pattern.